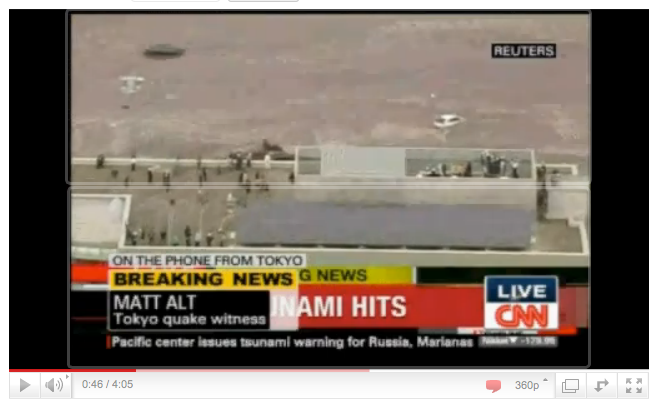 " The Maria Telkes "
The Sendai, Japan Airport as the Tsunami waters flood the runways . Notice the survivors on the roof , what you don't see, is people running from the solar panels. After this terrible disaster, those solar panels are ready to make electricity again, once the system has been inspected for damage. No one will be spending time and money pumping sea water on them, so they don't explode. A vlog of the building of a large Telkes Type solar oven on a wheeled carriage, using heavy 26 inch garden cart wheels. The total surface area of my glass is 673.75 sq. in. or 4.86 sq feet. That's 24.5 X 27.5 inches. The reflectors are 6,129 sq in. or 42.56 sq feet . 47.42 sq feet of total collecting power going into a box that is 10.89 cu. feet of space. Insulated with 3 types of insulation 5 inches thick. The oven is all steel construction. Construction began on June 1st 2009, and is documented in short clips, of each day's work. The project begins on June 1st 2009 in the archives . For 40 years the concept of solar ovens has rotated around the idea of bringing relief to a charcoal starved 3rd world. I read "Direct Use of the Sun's Energy" by Farrington Daniels in 1973. And it was 10 years old when I found it. It's the bible of solar power. Nothing has changed about the things Daniels laid out. Nothing. Materials science developed since 1964, but the things Daniels states about the sun, and the problems of capturing, and using that stored energy, it haven't changed a bit. But back to the ovens. This spring I planted a lot of sweet corn with the idea I would cook it , and sell it on a stick. Always with the idea of using solar power to do it. So, I went looking for the state of the art in solar ovens. It's still stuck on all those charcoal burners in the 3rd world. Which is to say , " How do we make a solar oven from cardboard, and tin foil, and heat a 3 qt pot ? " I'm serious, a fellow perfected that oven . It's called the Global Sun Oven . You can buy one for $289 bucks. Your purchase sends one somewhere into the 3rd world as well. And they're great, but I can't cook 100 ears of corn on one, all at one time. Which made me think , neither can someone in the 3rd world. No one has designed , and built a small solar oven like a backyard grill. With wheels on one end, and handles on the other, about 4 feet long. So, that's what this is, this is the building of that oven, with that goal in mind. All the designs, plans and clips will be free to anyone who can use them. Whether, it's tamales in Mexico, lamb in Mecca, or corn on Buddy Holly Ave.
5 - 100 count 3/16th pop rivets, small, med. 5 sheets of 26 ga sheet metal 41 1/2 " X 10 " 2"